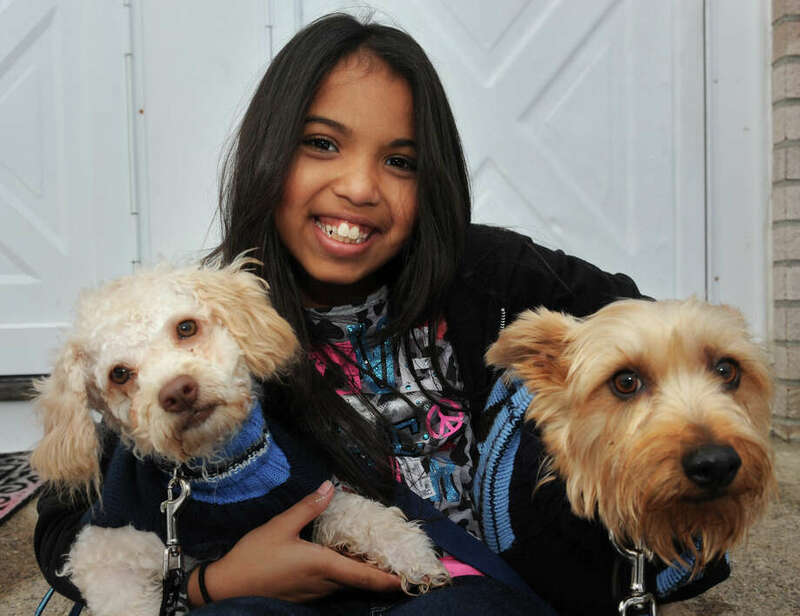 Arianna Rodriguez holds her dogs Skippy and Deuce on the front porch of her Bridgeport, Conn. home Nov. 8th, 2012. Rodriguez has organized a pet food drive in the wake of storm Sandy. Arianna Rodriguez, a 10-year-old fifth-grader at Bridgeport's Park City Magnet school, knows it wasn't just people who whose lives were turned upside down by Hurricane Sandy. What about the pets? The dogs and cats, in particular. "She's always been moved by stories about abused animals. `Mom,' she'd say, `how can we help?'" said her mother, Kelcia. "And she knows the name of every cat and dog in the neighborhood," she added. So Arianna has started a pet-food drive, distributing a simple flyer she created, and working through Facebook. At press time she'd secured a major donation of 20 cases of wet cat and dog food that's going to be distributed through PAWS and the ASPCA to pets in need. By the way, this young lady aspires to be a veterinarian when she grows up.